Every golfer who is serious about the sport understands the importance of practice. Yet golfers who don't have access to real grass must settle for practicing on range mats that do not react the same way natural turf does. Until now. FairwayPro the ultimate golf practice device allows you to practice the way you play. 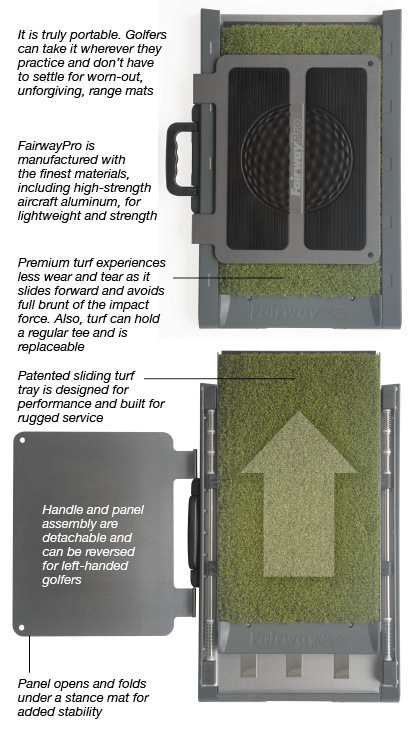 The patented design of FairwayPro includes a top turf tray that reacts when it's impacted by a club. Golf is a game that is played on grass. That's why FairwayPro is engineered to enable golfers to hit down-and-through, as on natural turf, while practicing at the driving range or at home. It's a brand-new way to practice golf, and you just might find it as enjoyable as playing a round of golf! The patented design of FairwayPro includes a top turf tray that reacts when it's impacted by a club. The turf tray slides forward and gives way, that is, it reacts the same way natural turf does, allowing you to hit down and through. Unlike the typical stationary range mats that force you to alter your swing, sometimes without even realizing it, to compensate for the problem of club head bounce. FairwayPro lets you practice and groove your authentic swing. The result is, you experience the feel of hitting off the fairway and properly taking a divot. 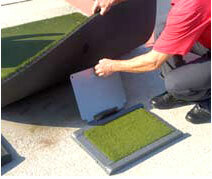 After the hit, the patented turf tray retraction mechanism immediately returns the turf tray to its original at rest position, ready for the next shot. • The turf tray slides forward when impacted by the club, reducing shock to golfer's body and potential for injury. This is especially true with fat shots. • FairwayPro gives truer feedback on your golf shots. With range mats, when you hit behind the ball, the club may still bounce off the hard surface into the ball, and the ball takes off as if you've executed a good hit. With FairwayPro, you'll know if you've hit behind the ball because the impact will cause the turf tray to start sliding forward and the club head will hit the ball with much less force. The ball flight will be affected when you hit a bad shot on FairwayPro, as it would on real grass. • Because FairwayPro provides truer feedback, golfers can practice shaping different shots and their short game. Your FairwayPro, Ultimate Divot Simulator, was fantastic. I was able to do impact drills for the first time ever! I was sold. Jim, I was very impressed with the quality. It felt like taking divots off a bent fairway. I believe you now have the best mat. I would endorse your FairwayPro mat to any country club, golf course, driving range or consumer. I believe once you hit off Jim McFarlin's FairwayPro Divot Simulator you will not want to hit off any other mat. I was surprised when I hit a few balls off the FairwayPro. It felt very solid, even though I made a few harsh descending blows. As a distributor, I am not only concerned about the marketability, but also the quality (read: claim rate) of the products we take on board. My teaching hat goes off to you for inventing the FairwayPro, 'Ultimate Divot Simulator'. 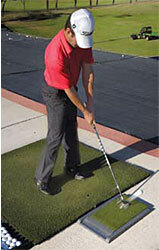 As a PGA Professional, I've been teaching students from hard standard mats for over 25 years. I enjoyed the experience of hitting balls from your simulator, it was soft and very realitisic, as if I was hitting off real grass outside. It was a pleasure to swing a club indoors, hit down and through knowing the 'Ultimate Divot Simulator' was going to absorb the blow. Jim, you have a winner, I recommend the FairwayPro, 'Ultimate Divot Simulator', to all players of all levels who are going to practice with the intent to improve there 'Real Course Swing' indoors or out. It's portable, light weight and easy for anyone to transport. Good Luck Jim. The FairwayPro product is the best hitting mat concept in the industry. The feel of the turf giving way at impact simulates the divot taken when you hit the ball on the fairway. Also, because of the 'give', this allows the turf to withstand impacts and extends the life of the mat 10 times longer than other traditional mat surfaces. A tremendous reduction in the cost of purchasing new mats every year. I also like the convenient carrying model which allows golfers to bring it to any driving range or use it in their home. After hitting the FairwayPro, I left a smooth fit than others. It helps to protect my joint. Despues de usar el fairwaypro senti el golpe mÃ¡s suave que con otros y esto ayuda a protejer mis articulaciones. I found the FairwayPro to provide great feedback for attack angle and have a true feel. A great way to feel, hear, and see what tour players do day in and day out. Plus it's portable... a winner in my book. During my time in golf, never have I seen a better practice mat. The FairwayPro will help you get a better feel when training and help to enhance your golf. I thought the FairwayPro was great. The resemblance to hitting off the FairwayPro Divot Simulator and taking a shot on the course was remarkable. If you have any questions regarding the FairwayPro Divot Simulator, please give us a call, we would be happy to help you with any questions you may have. Write an online review on the FairwayPro Divot Simulator, and share your thoughts with others.